Dallas Personal Trainer - An excellent exercise used by Personal Trainers throughout Dallas and the world for teaching proper pushup technique before the client has developed the strength to do full pushups. 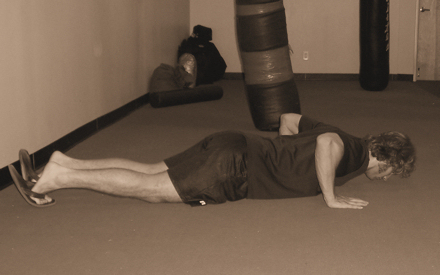 Many personal trainers allow their clients to do partial pushups until they are capable of doing full real pushups, however we do not believe this is the best solution because it does not take the muscles through the full range of motion and thereby does not allow important flexibility to develop. 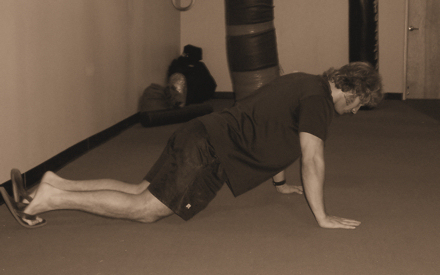 Get in a pushup position on the floor with your knees on the floor instead of your feet. Hold you body in a straight line from your shoulders down to your knees. Do not stick you rear end up in the air and do not let it fall down below your torso. Hold your body tight and lower your chest all the way to the ground until it touches. When your chest touches the ground, press yourself back up, making sure to keep your body tight and straight. Do not lay down when you touch your chest to the ground. Merely touch the ground lightly and then press back up. Keep your armpits tight and keep your shoulders down and back during the entire exercise.